It is hard to believe that it has been 2 years since our email system changed to Microsoft Office 365. While we have seen our fair share of problems with Office 365, the benefits have completely outweighed any of the issues we ran across. Moving from 500 Megabytes (MB) of storage space to 1 Terabyte (TB) per account has been a great asset to us all. 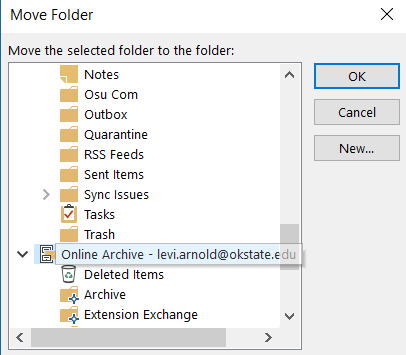 Because of this change in storage space, we are no longer required to archive our emails on a regular basis to ensure we continue receiving email. When we switched to Office 365, the old archive settings were removed from our accounts because they were no longer required. Office 365 includes an upgraded version of the old archive system we used before. The new online archive saves your email to the cloud instead of saving them to your computer’s hard drive and includes an additional 50 -100 Gigabytes (GB) of storage.) 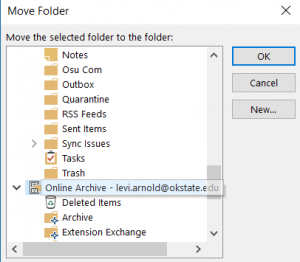 In addition, the archive can be accessed from anywhere and on any device with internet access, by using cowboymail.okstate.edu. 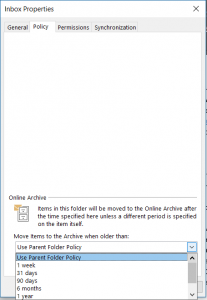 The online archive is disabled by default; however, you can change the settings to enable the archive. The following guide will show you have to adjust the archive settings. Change to the Policy tab at the top of the Properties window. 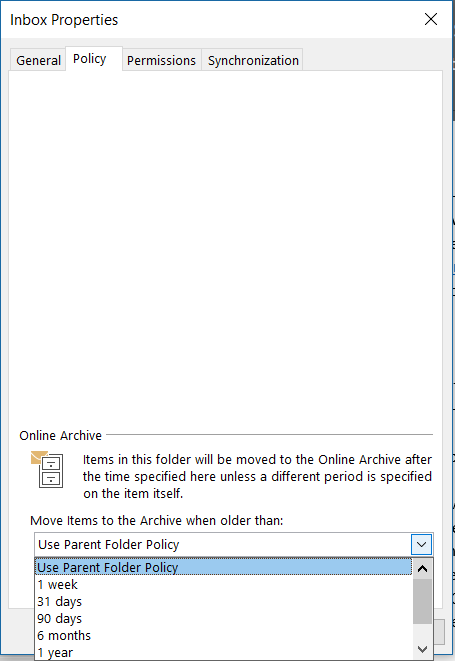 Use the drop-down list under Online Archive to change the archive settings for the folder. 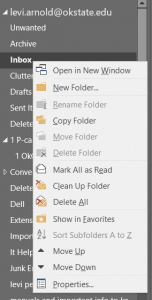 Right-click on the folder in your archive and choose move folder. Open the old archive folder containing items you would like to move. 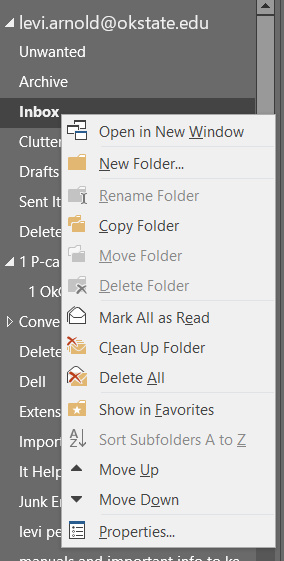 Right-click one of the emails to be moved, select move, and then choose other folder. Navigate to the correct folder and select OK.